The CDTX1200 series has been discontinued. Please see the CDTX-111/ CDTX-112 as a possible alternative or contact our Flow Engineering department. 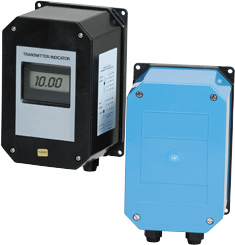 The CDTX1200 series conductivity transmitters use top of-the-line, 4-Ring Potentiometric probes. As opposed to the more widely used 2-Ring Amperometric method, the 4-Ring Potentiometric method provides the highest accuracy and repeatability attainable. When measuring liquids that have a high conductivity, the 2- Ring system is susceptible to polarization. This condition makes it exceptionally difficult to obtain measurements with any accuracy. The polarization is directly related to the electrode’s current load, and will cause a considerable, non-linear drop in the voltage. As a result, the solution around the electrode simulates a low conductivity condition. 4-Ring electrodes eliminate the polarization effect by splitting the four rings into 2 current electrodes and 2 voltage electrodes. When placed in a conductive liquid, the 2 current electrodes take the alternating voltage and create a current. This alternating current produces a Buffer Field from which polarization is absent. The voltage is then measured in this field assuring no altered readings. Voltage electrodes carry very little current. This allows the electrodes to be arranged in a manner where the current electrodes, which are the most susceptible to polarization, are placed where they cannot affect the voltage electrodes. Consequently, the Buffer Field is large enough for the voltage electrodes to take accurate readings without being effected by polarization. The wide range of OMEGA conductivity probes includes models for industrial applications. Flow-thru and dip versions are available. In particular, the latest addition to this family are probes with 1/2" and 3/4" external thread for mounting on commercial pipe tees. Some new conductivity probes combine the proven 4-ring potentiometric method of measuring conductivity with platinum sensors. The universally acclaimed 4-ring method provides a more stable measurement over a wider range. The probe does not suffer polarization, nor does it need frequent calibration or cell changes. The 4-pin CDE-1201 is a molded conductivity probe with pipe threads at both ends. The housing is fiber-reinforced polypropylene and can work with pressures up to 5 bar (72.5 psi) and temperatures as high as 80°C (176°F).